Do you want to know how to take the best pictures of your boat? Great photography is a key factor for guests deciding to stay on your boat. People are looking for a unique experience and to help your boat stand out from other listings and get more bookings, it is important to take the best possible pictures. Boats with beautiful pictures receive more interest and generate more bookings, so it is worth taking the time to get your photography right. Get the attention of guests, highlight what’s amazing, and set their expectations appropriately. Guests will then book with confidence. To help you get the most from your listing, we have highlighted our top tips to help you take the best pictures of your boat. Guests are more likely to book your boat if the pictures show that it is clean and tidy. Be as clean as you have ever been. To help yourself stand out we advise that the boat is fully cleaned before the photoshoot. The first image that potential guests will see is the cover photo – this should be the best photo you have of your boat. For best results try a wide angle, landscape shot of the boat taken on its mooring in its day to day surroundings. Pick a sunny day so that the colours and light is as its best. This photo should be the one that will encourage users to click through into your listing from the search results. Uploading the highest possible quality of image is the best point to remember here. The images of the boat are used in multiple formats throughout the site but only the cover image needs special attention (see above). Landscape images are more versatile than portrait images as these can be cropped to suit, whereas it is much trickier to do so from a portrait shot. Make sure that you try to get photos of your boat in as much natural light as possible. The best time to shoot is the first and last hour of sunlight of the day, known as the “Golden Hour.” This is the time of day where light is softest and brings out the broadest range of colour. Where this isn’t possible, try to ensure that the space you are shooting is filled with light rather than using pinpoint lights which can leave dark areas and shadows (and also cause reflections and harshness on the photos). Quite often the hardest shots to get in smaller spaces but just as important as some of the external shots. For interiors, try to get these framed as far back as possible to get wide shots that will give a sense of space. Make sure the boat is presented as nicely as you can make it and that interior features are captured. It is also good to get technology, books, computers, etc in the shots so that guests can see what entertainment is onboard. It is important to show the potential guests what the lifestyle is like when you stay on a boat. Make sure that the beds are made, towels are folded, there is fruit and/or flowers on display and any magazines or books are arranged nicely. If the boat has sunbathing cushions, it is always good to show these out and set up. Give the boat a good “homely” feel. When guests search to stay on a boat they don’t just do so because they are looking for unusual accommodation, it is also about being a unique experience. Use your photos to convey the experiential aspect of the holiday. Take photos of your favourite sun downer spots, the marina buildings, restaurants and local landmarks nearby. Guests are looking to enjoy local food and culture as well as just accommodation. The more photos you include the more guests will be likely to browse them. It gives your guest the most information to make their decision, and importantly allows them to take time viewing your boats listing. Try not to capture the same aspect multiple times, but throw in a variety of things. Give guests a great idea of what your boat is really like. 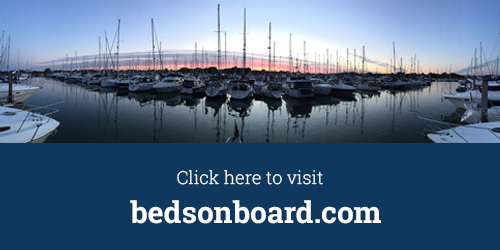 Now that you know how to get the most from your photos, its time to visit bedsonboard.com and create a listing for your boat. Of course, you can log in and update the photos you already have uploaded. Beds on Board can facilitate a professional photography service for your boat. Please contact us for more details. Do you have any photography tips? We’d love to hear them.